Each morning, as I say goodbye to my youngest children, they receive a blessing on their foreheads with the words, “Bring God glory through your actions.” It is a little phrase, sometimes shouted as they turn to run through the school gates, but I pray that it sets on their hearts and that they learn to grow in faith and love in their daily actions. How do we actually serve Him constantly in this busy world where it seems we serve everyone except the Lord? It is in that precise question where we find the answer. We bring God glory through our everyday actions. By taking the hand of your child, by giving a co-worker a smile or word of encouragement, by devoting a little extra time to ask a fellow student how they are doing, or asking someone if they need help, by fasting throughout the day as a private devotion to our beloved, by moving the laundry over and asking the Lord to clothe with righteousness all those who wear, or touch, or see these fabrics. What we do and how we do it matters. Even the minor things. It isn’t enough to just say that we love God. Our actions, our behaviors, our words, must live out that love. Lent gives us a purposeful time to live out our love in specific action. Lent isn’t only about suffering through the witching hour without a glass of wine, or giving up our social media for a few weeks, or waking up early to pray in the quiet of the morning. If we only practice the big moments of devotion, we miss all the little moments which make up our lives. 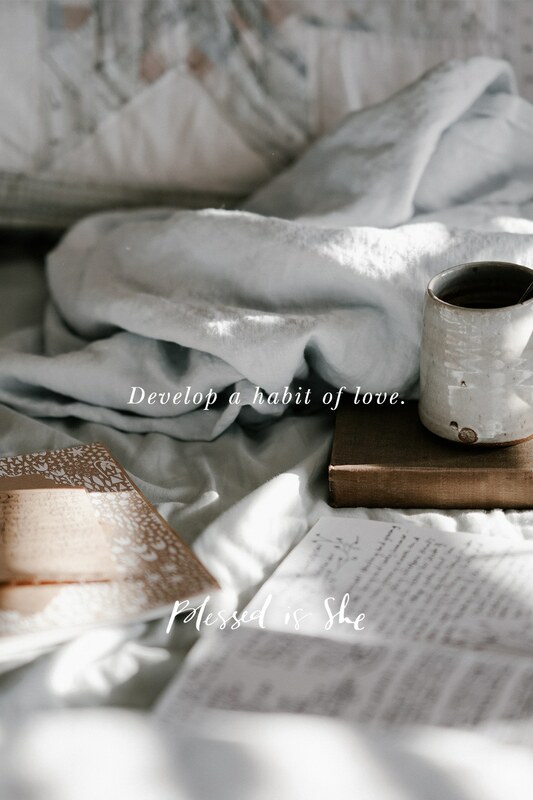 Do the big things too when you can, but as Lent draws to a close, let’s try to also develop a habit of love in action with the little things, all the time. That is where we will find ourselves living the life of constant prayer. Let’s try to develop a habit of love in action with the little things, all the time. How are you doing with your Lenten commitments of Fasting, Prayer, and Almsgiving? Have you given up? Even if you have struggled in the tedium of the last few weeks, recommit yourself to what matters most today. Beautiful ideas, especially the laundry prayer! Thank you! I prayerfully thank you for the reminder that the little things count.. now I will add a blessing to my grandchildren’s forehead as a reminder of Gods love for them & to share His love t/o their day. We pray evening prayers at bedtime . Their parents have not done this until recently. Now they will be blessed as they begin & end their day. Nice to know someone else is suffering through the witching hour and growing weary as Lent winds done. Thanks for the reminders and encouragement! Such a beautiful reflection. Thank you! Thank you for this…very inspiring. Absolutely love this! Thank you for reminding us that little things matter. I have been feeling that nothing I do is making a difference. This made my day and left a lasting impression. This is so incredibly beautiful and true! I was reading this on my lunch break at work and JUST praying about ways to incorporate devotion to God in the daily office grind. Super timely to come across your wise words!